I don't have all lights in use right now. The other ones are either under construction or just planned or will not be finished. These descriptions are not meant to be followed exactely but as inspiration for your own construction (mail me when finished !). At this page one piece lights are described. I.e. 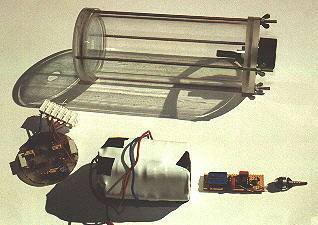 bulb and accumulator are in the same casing. This solution is easy to build, because there are only few sealings and passing throughs. But if you want to use your light comfortably, the capacitance (operating time) is limited. And there is the effect of the heat to the accumulator. My first light is the classical type of a handlight with tubular form. The construction arose mainly of the materials I was able to get and the insufficient tools. A water pressure tube with a diameter of 11cm and 7mm wall thickness is the main part. The endings should be grinded well to get a good sealing. Be careful when using machines for grinding. The material must not get hot or you achieve the contrary. Both endparts are identical and made from Plexiglas. They were sawn circular. Then with a turning-lathe a smaller diameter was machined off a part of the disc. After that a rectangular shape was sawn and the corners rounded. The caps are sealed with a flat sealing to the tube. The sealings are also used when making jam. They accidently have the right measure, are cheap and durable. The caps are pressed together with four long bolts. The two lead acid batteries (each 6V/4Ah) are located between three discs of alu and plastics which also hold together with the help of thread rods. 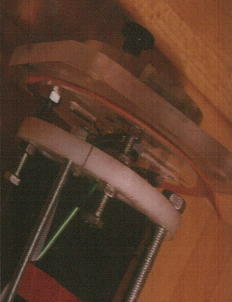 The electronics are mounted onto the accu and fixed with angles of sheet metal. 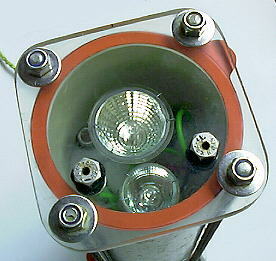 Both reflector bulbs (20W spot 35mm , 35W flood 51mm) are mounted to the upper end piece. 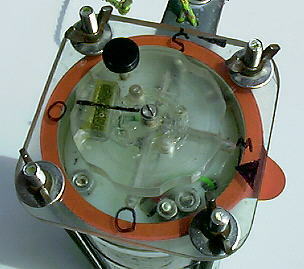 The complete unit is fixed with bolts to the lower cap which also holds the reed contacts for the switch. They are triggered by a magnet inside a rotating knob mounted on the outside. 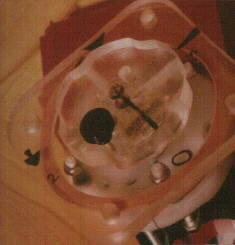 The knob is made of a round plate of Plexiglas. The magnet is sealed with 2component glue. For easy handling the plate has 6 circular 180° inlets. A drilling machine with a big drill will do. A milling cutter will do better. A round file is another possibility. A bolt in the disc and a depression in the cap serve as transportation security. Don't forget ! To get notch positions drill a not-through hole in the rotating knob and depressions in the cap. Put a stainless spring and a ball into the hole. A glass ball would be fine, but I didn't get one. A stainless bearing ball was not available (except in thousands quantities). Then I took one from a bicycle store. Despite a lot of grease it gathers rust fast. There are 2 sealed sockets at the upper cap for charging, somewhere not in the way of the light. A diode prevents discharging of the batteries. Maybe a relais would be better, but I have to think about that. The handle is a polyamid rod, which is screwed to a metal angle. 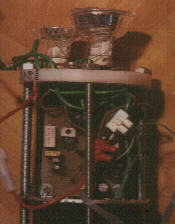 It is fixed to the main body with two stainless steel collars. A few holes in the handle and the angle are used to fix a rope. I tested the light in a pressure tank and there were no problems down to 70m. 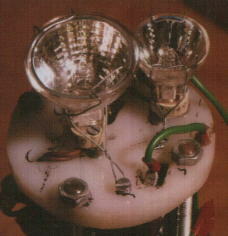 The warming of the outside in use is just sensable, so it is even possible to use a 50W bulb. Just to be sure I connected a thermal fuse, which disconnects at about 70° C.
To me the possibility to switch between bulbs of different power and angle is very pleasant. Until now I nerver had any problems with this light. The seals must be controlled and cleaned regulary. The handling for opening and changing of parts is not very comfortable but seldom necessary. The weight in the water is relative modest because of the big volume. 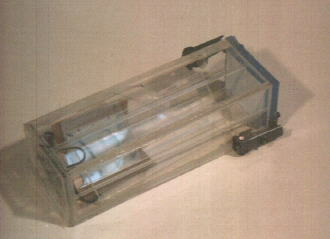 I started this light because I wanted to gain some experience for a later building of a camera case. The body is made of four rectangular Plexiglas plates which form a sqare area. One cap is glued, the other one is held by spring-loaded clamps. Unfortunately I wasn't able to get a correct seal until now. The sharp edges wouldn't be very comfortable in use, I think. This light isn't finished right now. If you gain experience, you learn that a small, light diving light is very useful. The body is made of persplex. A rotating switch is connected to a sealed pass through with knob. Threaded poles press the caps against the body. 12 NiCd accumulators 1,9Ah. I want to use two 35mm reflector bulbs, but the place including electronics is very limited. See german page for finished version. English will follow.